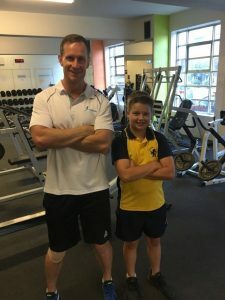 Longevity client, James has been nominated to take part in the NSW Rugby Union Waratahs’s academy. This invite only opportunity will involve instruction from ex-Waratah players for the top 12-14 year old rugby players in the state and is a promising step in James’ rugby career. James’ weekly training sessions with Longevity have always been programmed to mitigate injury risk and promote proper movement patterns, which has translated into success on the field. James has been regularly training with Longevity and has seen steady results. In the past year, he has increased his maximum push up test from 14 to 24 (70% improvement), increased his sub-maximal treadmill test time by 4 minutes, and has worked up to an 80-pound sled push. Although previously controversial, it is becoming more and more accepted that resistance training is safe and effective for youth. When considering the load when you compare running or a box jump (traditionally thought of as “safer”), it is obvious that the loading on the body during resistance training is actually much safer when performed in a controlled environment. Taking this one step further, a bench press for a child is often less than their own body weight, therefore there is less loading on the shoulders and upper body than a push up! Previous concerns over growth stunting and early development of muscular imbalances are not supported with appropriate exercise prescription. Just as in an adult population, increases in muscular strength, endurance, balance and agility can be achieved in younger populations. Furthermore, increasing peak bone mass before age 18 (when 90% of bone development has already occurred) dramatically decreases the risk of osteoporosis later in life. When a younger population comes to us at Longevity, we work on slowly and appropriately progressing exercises to improve health, limit injury risk and increase athleticism. From balance and proprioceptive training to progressive resistance exercise we focus on getting children in the best shape in the safest way. For the kids involved in sports, we have plenty of experience training sport and position specific characteristics to best prepare your child for competition. This involves off season training traditionally strength focused, preparing for a new season often focused on power training, and maintaining muscle and soft tissue health during a season through load management of specific movements and body parts. Establishing exercise routines for the younger population is a growing concern with the obesity epidemic worsening year after year. Encouraging physical activity early in life is linked with decreased rates of obesity and cardiovascular disease later in life. With resistance training accumulating a growing body of evidence as safe and effective for youth, this is another exciting mode of exercise that can encourage the next generation to get off screen and start improving performance for life! For more information, check out the Australian Strength and Conditioning Association position stand on youth resistance training.